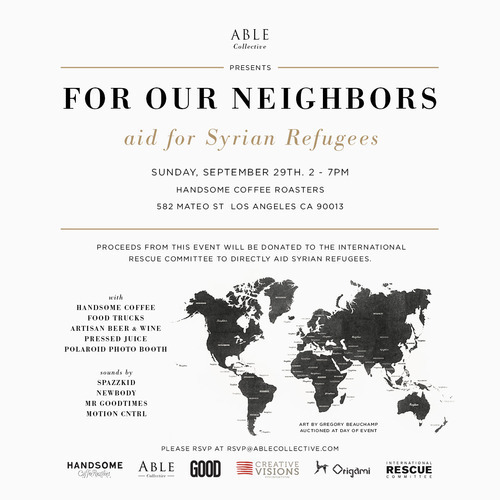 This Sunday, our friends at Able Collective are hosting a fundraising event to aid Syrian refugees that have either been displaced or trapped by the violent civil war in Syria. For Our Neighbors will happen from 2pm-7pm at Handsome Coffee Roasters in downtown LA and will include music, food trucks, artisan beer and wine, a gift market, and an appearance by activist Sara Jawhari. One-third of Syria’s population has been driven from their homes by violent conflict, including 5 million people who remain inside Syria and 2 million who have fled across the borders. This weekend, take the opportunity to join your local community to support a community that is facing violence, disaster, and displacement. We here at The Work Mag encourage you to do your part as a global citizen— any action, no matter how small, is still an action.